More info coming soon. Memories to share? Get in touch! shows Russell back row third from right. The family lived at Weston Place, Park Street and his father Fred drove on the buses. I read recently about a history group in the Bartonsham area interested in comments from old scholars of St James C of E School. I don’t have their address so I’m writing to you. I started school about 1941 and remember teachers Ms Hall, Mrs Bradley (who occasionally brought her handicapped daughter), Mrs Davies and ? Mrs Jones. One winter I couldn’t walk to school (from Portfields) because of bleeding chilblains. Ms Hall who was the headmistress kindly took me in her car – once I was forgotten at home time and the cleaner found me. Although wartime we had our milk ration every day. We all had a beaker and put this on a table with our name on a card. When the sirens went we ran to nearby houses – we were allocated a particular place. My mother once found my sister out in the street as no one was home at her allotted house. In later years we took our gas masks and a torch to school and were escorted through the vicarage grounds and into the General Hospital underground shelters when the sirens sounded. I distinctly remember learning to write and made a very large capital H – you were told “big enough for a car to drive through” - I felt so bad as you could not erase an error. Girls knitted dishcloths and boys made raffia mats. If late for school, boys were caned. We had maypole dancing and were very proficient out in the yard. The [piano would be pushed up to the door, the mothers were invited. (I used some of the music and drills when teaching here in Adelaide and found a maypole in one school.) We did country dancing and performed on the Castle Green some of those dances I’ve taught in Adelaide. We also presented a nativity play at the Shirehall. Each class had a small garden at the back of the school. We had a lot of fun, sometimes the boys chased us home, other times they let us play with them. We helped by making snowballs to be thrown at boys in the next street. We had a great start to our learning and I am thankful for St James’ School. My sister and brother also attended before me. My father was a piano tuner for Gilbert and Leslie Heins on Broad Street. 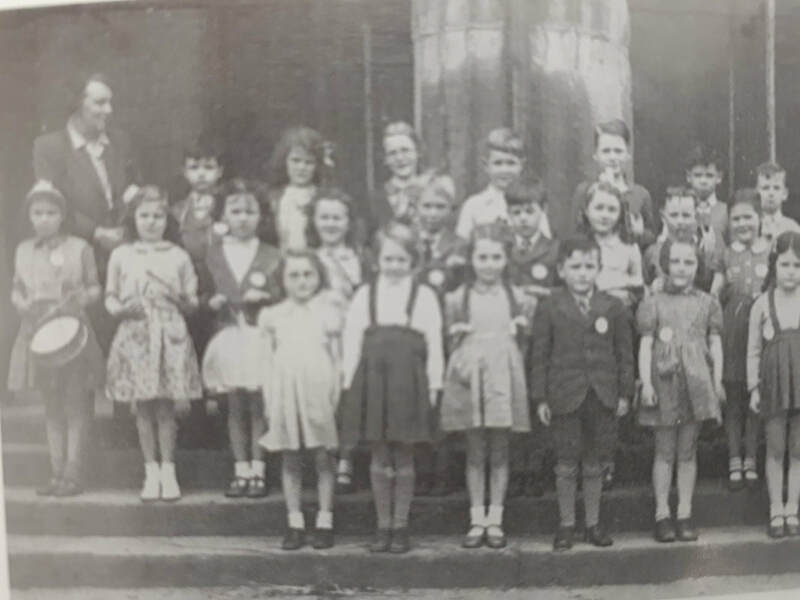 1947 and the band and choir from St James School with headmistress Miss Davies on the steps of the Shire Hall. (Pam Cochrane loaned the photo to Age to Age).